Don’t miss “The Dream Machine: The Beat Generation & the Counterculture, 1940-1975,” a major exhibit on the Beat Generation, on display in the Schatten Gallery on Level 3 of the Robert W. Woodruff Library. May at Emory is caught up in the wave of Commencement, with the big event and lots of other activities surrounding it. But there is still plenty to do on campus, particularly if you enjoy exhibits and musical performances, both before and after the May 14 ceremony. 1. Catch the Pitts exhibition on African Christianity. "Expressions and Encounters: Experiencing the Histories and Theologies of African Christianity in the Collections of Pitts Theology Library," which opened in March, runs through July 20. Whether you are a student, researcher or just someone who wants to reflect on the diversity of contexts and realities that inform the expressions of African Christianity, this exhibition displays manuscripts, photographs, books and artifacts, including a Coptic triptych. Visit during library hours. A free, guided tour is available on Friday, May 4, at 1 p.m.
2. Hear treasures of song performed by Emory voice and piano faculty. The Emory Chamber Music Society of Atlanta presents a free concert, "Liederabend," on Friday, May 4, at noon in Ackerman Hall of the Michael C. Carlos Museum. Hear the talented members of the music department perform music of Bizet, Strauss, Cilea, Bernstein, Bowles and Carter. Doors open at 11:30 a.m.
3. Eat and shop for good food in beautiful weather. The Emory Farmers Market is always a good idea and especially in May with the perfect weather to be outdoors, enjoying the good food there. It’s free to visit and you can spend as much or as little as you want. You can choose from the variety of choices of prepared food, have some coffee or buy fresh, locally grown food to prepare at home. The markets are held Tuesdays, from 11 a.m. to 3 p.m. For market regulars and newcomers, there is good news: Throughout this summer, markets will be held every other week instead of just monthly. 4. Take a tour of Emory’s WaterHub. There are two scheduled tours this month, on Tuesday, May 8, at 2:30 p.m. and Wednesday, May 9, at 11 a.m. It’s a good chance to see this water recycling facility, unique not only to Emory but also to other institutions throughout the country, and learn from student guides on how it works. The scheduled tours are free. Check the Emory calendar for future tours if you can’t make it this month. 5. Enhance your professional life with useful tools for healthy work-life balance. "Wellness Matters: Understanding Why the Balanced Professional Gets Ahead" is a free webinar conducted by Ca Trice Glenn 12T, counselor and adjunct professor at the Candler School of Theology, who will discuss how self-care and balanced-life strategies are essential to professional success. She will also show you helpful tools to develop a healthy work-life balance plan. The webinar will be Wednesday, May 9, at noon. 6. Enjoy major orchestral works from the Emory Youth Symphony Orchestra. The Emory Youth Symphony Orchestra, consisting of the region’s premiere young musicians, will perform on Wednesday, May 9, at 8 p.m., conducted by Richard Prior, composer and Emory director of performance studies, and Paul Bhasin, conductor of Emory’s Wind Ensemble. The free performance will be held at in Emerson Concert Hall at the Schwartz Center for Performing Arts. 7. Come enjoy the Candler Singers as they kick off Candler School of Theology's Commencement Weekend. Candler's premier musical ensemble is comprised of students preparing for a variety of ministries in the church, the academy and the world. Hear their concert of church music from around the globe, featuring classical, contemporary, folk and spiritual genres. The free concert is Saturday, May 12, at 5 p.m. in Cannon Chapel. Many of Emory’s undergraduate student a cappella groups also perform during Commencement Weekend; check the Commencement schedule for dates and times. 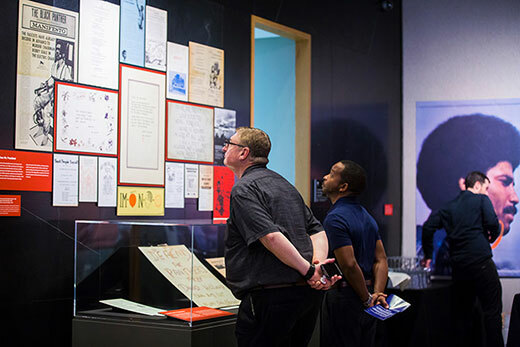 The "Dream Machine" exhibition showcases the influential countercultural group of writers known as the “Beats” and is the first major consideration of this group is in the United States in nearly a decade. Rare artifacts of postwar literature with interactive elements will give you an immersive experience in this exciting era. The free exhibition is in the Schatten Gallery on Level 3 of the Robert W. Woodruff Library through June 17 and accessible during library hours. 9. Learn smart ways to plan and reduce stress when balancing the needs of young and aging loved ones. "Extra Planning, Hold the Stress: Smart Advice for Not Getting Squeezed When You're in the Sandwich Generation" will be Monday, May 21, at noon in Room 1.432 at 1955 Clifton Road. Get advice and guidance from an elder law and estate planning attorney on challenges faced by adults having to make care decisions for aging parents while still raising minor children. Special emphasis will be on dealing with the competing financial priorities that often arise for members of the sandwich generation. This presentation is free. 10. Learn from experts about how a start-up venture in health care and technology gets done. You can network with people in the industry, from Emory’s Office of Technology Transfer and the Georgia Tech Research Corporation, hear them discuss how technologies move successfully from the academic environment and into a company and ask questions. The free event, "How Start-Ups Are Founded & Deals Get Done," is Monday, May 21, at 5 p.m. in Room 234 of Goizueta Business School.